A multimedia exhibition of Salman Rushdie’s manuscripts, drawings, journals, letters, photos, and digital materials will be on display February 26 through September 26 in Woodruff Library’s Schatten Gallery. For more, go to www.emory.edu/rushdie. To see a series of videos on Rushdie's computer archives, as well as Rushdie himself, visit www.emory.edu/rushdie. Soon, you will be able to peruse the email correspondence between Distinguished Writer-in-Residence Salman Rushdie and U2’s Bono. Or quick-search how many times the words tequila and rock goddess appear in the first draft of Rushdie’s novel The Ground Beneath Her Feet. You even will be able to log on to a laptop as Sir Rushdie himself, tinkering with a sentence, adding an embellishment, or marking a particular spot of interest in a manuscript (don’t worry, these changes won’t register on the master file, which reverts back to the original text as soon as you log off). Emory acquired the archives of Rushdie—the Indian-born author whose fourth novel, The Satanic Verses, earned him not only critical acclaim but also death threats from Islamists and a fatwa from Iran’s Ayatollah Khomeini—in late 2006. Like many of his contemporaries, Rushdie wrote his later works and conducted much of his correspondence and research on personal computers. So his archive is a hybrid, meaning that Emory’s Manuscript, Archives, and Rare Book Library (MARBL) received not only one hundred linear feet of his paper material, including diaries, notebooks, library books, first-edition novels, notes scribbled on napkins, but also forty thousand files and eighteen gigabytes of data on a Mac desktop, three Mac laptops, and an external hard drive. Born-digital archives have changed the game on several fronts for libraries and universities with notable literary collections: the methods used to preserve, protect, and organize the materials; the process by which the archives are accessed, shared, and exhibited; the ways scholars conduct research and interact with the materials; and the legal and ethical issues surrounding intellectual property and privacy. Archivists of days past could only have dreamed of such a wealth of original materials efficiently stored as binary data in monolithic black boxes. Today’s top university libraries are bidding over not only first editions, but PCs and zip drives. The University of Texas at Austin’s Harry Ransom Center has the nicotine-stained laptop used by Norman Mailer’s longtime assistant, Judith McNally, as well as more than 350 computer disks, forty-seven electronic files including email, forty CDs, two other laptops, and a magnetic tape spool. Harvard University’s Houghton Library has fifty of John Updike’s floppy disks, which arrived just before the author’s death in January 2009. And Emory has not only Rushdie’s computers but floppy disks from Pulitzer Prize–winning author Alice Walker and Magnavox disks from poet Lucille Clifton’s collection. President James Wagner has determined that a discretionary gift of $500,000 will be directed toward supporting a born-digital laboratory at the library, which will enable advanced forensic analysis and treatment of born-digital archival content. This money also will support continued development of tools and resources for born-digital and hybrid archives at the University. At the center of all the optimism, however, is a hard truth: dealing with born-digital materials involves a huge shift in methodology. To put it bluntly, digital archivists are making it up as they go along. When the British Library held one of the first conferences on the emerging field of personal digital archives in London last year, Farr and Nelson were invited presenters. They spoke about Emory Libraries’ method of collecting, preserving, and providing access to born-digital records, the progress made with the digital portions of Rushdie’s archive, and plans for future work with digital materials. “Other libraries are very interested in what Emory is doing—both because the Rushdie files are the most complete high-profile set of e-manuscripts currently in a repository, and because they think our vision for the program is very exciting,” Nelson says. A particular challenge, she says, is that technology may have moved beyond the hardware or software artifacts in an author’s archive. For example, working parts may be difficult to find for a broken, early model computer, disks might be unable to be read, programs the author used might be outdated (think eight-track tapes without an eight-track tape player). Rushdie’s archives include a laptop he had spilled a soda on that didn’t appear to work anymore; the library’s computer experts were able to extract the information from it without even turning it on. Yes, where there are computer conundrums, there are techies. University libraries have found themselves hiring not only IT support, but programmers and computer security experts able to surmount compatibility issues and recover material that is corrupted or otherwise inaccessible. Rushdie’s digital archive has its own dream team: Ben Ranker, senior engineer for the libraries’ software development team, who came to Emory from IBM; and software engineer Peter Hornsby, who previously worked on mainframes at Georgia State University. 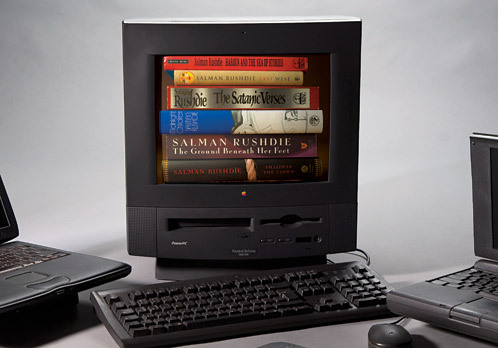 Ranker, who organized the database that allows users to delve into Rushdie’s digital world, says the project meant he had to learn more about fifteen-year-old Macs than he ever imagined possible. The team plans to provide access to Rushdie’s electronic materials not only to scholars but to the public as well. Selections will be on display in an exhibition that opens in February in Woodruff Library’s Schatten Gallery, “A World Mapped by Stories: The Salman Rushdie Archive.” Like Rushdie’s archives, the exhibition will be a hybrid, mixing portions of his digital and paper materials throughout. A tall order, but one that engages Emory’s digital team precisely because of its nearly limitless—and as yet undetermined—possibilities.